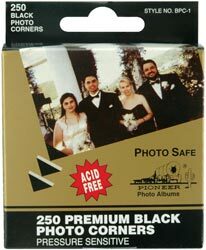 Pressure sensitive adhesive corners for photos, cards, paper items, scrapbook memorabilia, and other projects. simply press on scrapbook page and insert treasured photos. Also great for postcards and documents.